The global use of untreated waste water from cities to irrigate crops is much more widespread than previously estimated, says a new report. Some 800 million people, including farmers, vendors and consumers are said to be exposed to serious health risks. China, India, Pakistan, Mexico and Iran account for most of the treated land. 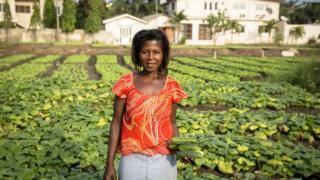 The huge populations in big cities across the developing world make very attractive markets for farmers. The lack of refrigeration and transport means that crops need to be grown close to these consumers. Being close to cities also provides a key element for the crops - plentiful amounts of nutrient-rich waste water. "Some might call it sewage, but it's mostly domestic waste water, although it can contain industrial effluent," says study co-author Dr Pay Drechsel, from the International Water Management Institute (IWMI). "But in our report we've not just looked at waste water, we've also looked at the waste water that enters the rivers and streams, where it gets diluted to some extent but it is still tremendously dangerous when it comes to farmers' fields." According to the study, some 65% of all irrigated land areas are within 40km downstream of urban areas. A significant amount of that land is in countries with very limited waste water treatment, exposing 885 million urban consumers, farmers and food vendors to health risks, according to the authors. "The area with untreated waste water is around 30 million hectares, a 50% increase on the previous estimate," said Dr Drechsel, who also leads the CGIAR Research Program on water, land and ecosystems. "The previous figure was not based on science, so this new approach combines geographic information, and is the first scientific approach to get hold of the area that is irrigated with raw or diluted waste water." The authors give the example of Ghana where across the five biggest cities, around 2,000 farmers work close to these urban centres, growing cash crops with waste water as every other water source is polluted. The farmers often produce crops which are consumed as street food by around 800,000 people. These can contain "unbelievable amounts" of e-coli bacteria, say the authors. "The de-facto re-use of urban waste water is understandable, given the combination of increasing water pollution and declining fresh water availability, as seen in many developing countries," said Anne Thebo, from the University of California, Berkeley, in the US, and lead author of the study. "As long as investment in waste water treatment lags far behind population growth, large numbers of consumers eating raw produce will face heightened threats to food safety." One of the difficulties is that farmers often prefer the raw, untreated waste water as it usually has a higher concentration of nutrients than other water sources. In Pakistan, farmers say the treated waste water is safer but too saline for their crops. "Even when it's diluted, although the nutrient content goes down the pathogen content stays high. This makes it very tricky," added Dr Drechsel. The authors say that bringing more water treatment plants online would help but that it is a very slow process. It took Ghana several decades to be able to treat around 15% of its water. The researchers say that while resources are a challenge, the biggest issue remains risk awareness. "You try at multiple critical control points to reduce the risk between the farm and fork," said Dr Drechsel. "This can be through safer irrigation, or greater hygiene at markets and also people can effectively wash the vegetables so you can get rid of most of the pathogens - but in those countries where it is most needed, there is no risk awareness. People don't know about bacteria. "So like the hand-wash campaigners we must try for something to effect behaviour change - and we are working on that. "Waste water is one of the future opportunities if we can find ways of making the best use of it without risking food safety." The research has been published in the journal Environmental Research Letters.